The Agathonisi Symi ferry route connects Dodecanese Islands with Dodecanese Islands. Currently there is just the 1 ferry company operating this ferry service, Dodekanisos Seaways. The crossing operates up to 1 times each week with sailing durations from around 4 hours 50 minutes. Agathonisi Symi sailing durations and frequency may vary from season to season so we’d advise doing a live check to get the most up to date information. Forming part of the Dodecanese group of islands, the Greek island of Agathonisi is the most northerly of the Dodecanese islands. It is surrounded by a number of smaller islands and is around 16 miles from the islands of Samos and 23 miles from Patmos. There are three main settlements on the island which are Megálo Chorió ("Big Village"), and Mikró Chorió ("Small Village") and the island's only port is the settlement of Agios Georgios (Saint George). The island is sometimes referred to by its ancient name, Tragea or as Gaidaro. 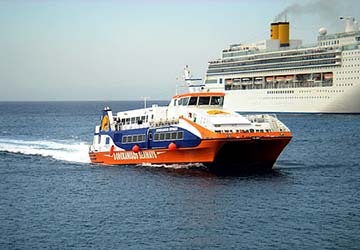 The crossing to the island can be by either conventional ferry of by high speed ferry depending on the time and day of the crossing and by the ferry operator chosen. Crossing times are around 8-11 hours by high speed ferry and 6.5 - 8.5 hours by conventional ferry depending on route and operator.